Millions of engaged couples turn to WeddingWire as their trusted wedding resource, with the largest directory of local wedding vendors in Alaska. Easily find the best wedding services in your area with detailed vendor...Read more reviews, prices and availability for your wedding day. The northernmost state in the nation, Alaska is an explorer's dream. Plan your dream Alaska wedding for an unforgettable experience. There is no way to visit Alaska without encountering awe-inspiring beauty. The landscape here is seemingly untouched, and wildlife is truly wild and everywhere. Everywhere you go in Alaska you can explore the surrounding wilderness, but in Anchorage, you can also return to the comforts of a city. Anchorage is Alaska's largest city, and though it began as a frontier town, it is now a booming draw in the Land of the Midnight Sun. Here you can hike mountains, visit clear mountain lakes, and climb glaciers, all among the moose, eagles, and other wildlife occupying Alaska. If you're in the mood for a metropolitan escape, Anchorage also offers all the comforts of city life, with museums, theatre, restaurants, and more. The Alaska Native Heritage Center celebrates the culture of all Alaskans. You can hold your wedding here, with Lake Tiulana and lush mountains serving as your backdrop in any season. Homer, a small town of about 5,000, is beautifully situated beneath the Kenai Mountains and on the banks of Kachemak Bay. Homer Spit, a 4.5-mile long strip of land that stretches into Kachemak Bay, is full of folks every summer. Boats and birders float in and out, while people fish for salmon and meander along the beach. For those seeking a bit of indulgence after hiking or exploring local glaciers in Homer, Second Star is the destination for you. This Alaska wedding venue, located right on Kachemak Bay, encompasses the best of Alaskan nature and spectacularly indulgent comforts for your Alaska wedding. Juneau, Alaska's picturesque state capital, is nestled between Mount Roberts, Mount Juneau, and the Gastineau Channel and can only be reached by boat or plane. For a truly Alaskan experience, visit the Juneau icefield. There are 38 major glaciers included in this 1,500 square mile icefield, many of which can be hiked and explored. 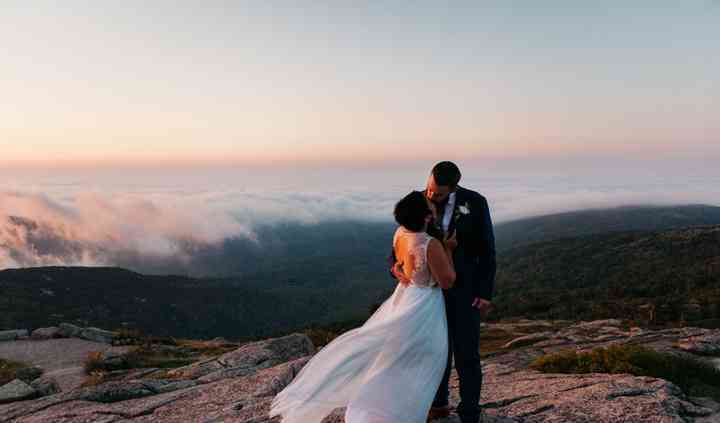 You can even plan a tiny ceremony on a glacier! If you're a fan of wildlife and are here in the summer, take one of the whale-watching tours offered in the area, where you can see orcas, humpback whales, sea lions, and porpoises. As one of Alaska's oldest cities, Juneau has no shortage of history or nature to explore. But, if you'd like to break away from this aspect of Juneau for your Alaska wedding, Suite 907 is the perfect Alaska wedding venue. This sizable locale has an LED dance floor and plenty of room for your event so you can plan the wedding of a lifetime. As one might expect, it's cold in Alaska, but because this state is huge, just how cold depends on where you are. The Northern Interior of Alaska gets the coldest, while the Interior region generally has warm summers. Do your research and pay attention to the region's weather patterns as you plan your wedding, and you can prepare accordingly. Regardless of the season, allow your décor to reflect the majesty of nature in Alaska. Incorporate native plants into your décor and use swaths of evergreen branches in lieu of fabric across the walls. Let the colors of the surrounding glaciers and forests be your inspiration, and use icy blues and forest greens for a regal Alaska wedding. If you're planning an elegant wedding, include Alaskan King Crab and smoked salmon on your menu for a decadent seafood fête. For a more casual or lodge-themed wedding, consider unusual Alaskan foods like Reindeer dogs or caribou for a local delight. Either way, an Alaska wedding caterer can help you choose the menu that's right for your wedding. Keep spirits high with an Alaska wedding band to bring live music to your event. You and your guests will enjoy dancing into the night with the right music for your wedding in Alaska. Weddings in Alaska are on par with the national average, so you shouldn't expect any crazy expenses (unless you plan a glacier-top wedding, which is only reachable by helicopter!). There's no sales tax here, and Alaska residents don't pay income tax either. There is a vehicle rental tax here, as well as bed taxes and an excise tax on overnight accommodations in Alaska waters, so consider these travel costs as you plan your Alaska wedding. A marriage license in Alaska costs approximately $60, but applicants don't need to be Alaska residents. Bring a government-issued ID and birth certificate to present proof of age, and plan ahead as there is a three-day waiting period after applying for your marriage license. After the license has been issued, it remains valid for three months from the date of issue.